Our popular looseleaf blend, selected for a long harvest. Gourmet Blend features a tasty and colorful mix of five looseleafs in shades from green to red and textures from oakleaf to tightly ruffled. Fast-growing, tender, colorful and tolerant of hot weather, our popular looseleaf blend is selected for a long harvest. Grows best in cool weather and can be planted in early spring or grown as a fall crop. Protect from heat with shade cloth. Likes fertile soil, ample water. Best when picked minutes before your meal. Space lettuce plants 8" apart. We searched the world to find the best organic seed-Burpee fully guarantees that not a drop of synthetic chemicals was used to make these excellent seeds. Certified Organic Seed. Lettuce, Gourmet Blend Organic is rated 5.0 out of 5 by 2. Rated 5 out of 5 by TerrorSpedMom from Prolific! 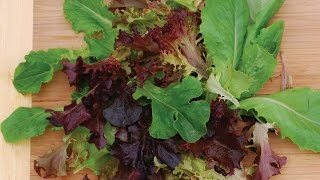 Perfect mix for our family for salads as well as for the guinea pig! I'd just take the big colander out every few days and shear them down. They grew from early Spring until it became too hot in late Summer. Rated 5 out of 5 by drew from Best lettuce ever!!! 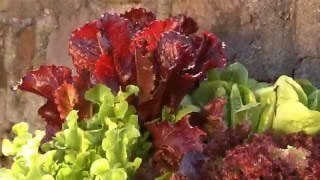 This lettuce grows exteramly fast and tases delious.